This is a savory and delicious accompaniment to Thanksgiving turkey but it also works well with pork and chicken throughout the year. It is full of Italian flavor. 1/2 cup chopped fresh Italian parsley the flat leaf parsley. Cook the sausage in a large skillet, breaking into small pieces with a spatula until browned, about 15 minutes. Transfer to a strainer to drain off fat. Wipe the skillet clean. Add the olive oil, onion and celery to the skillet. Cook, stirring, over medium low heat until the vegetables are tender, but not browned, about 15 minutes. Add the garlic and dried herbs; cook 1 minute. Remove the skillet from the heat. Add the sausage, contents from the skillet, sun-dried tomatoes, cheese, parsley and a generous grinding of black pepper to the croutons in the bowl. Combine the ingredients. Add 3 cups of the broth to the ingredients; stir to combine.When that is absorbed, add another 1/2 cup. 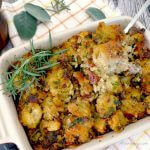 Check the croutons to see if they are moist -- if not add another 1/2 cup of broth. Depending on the density of the bread I will let the dressing rest for 15 to 30 minutes and then go back and check. The dressing should be moist but not mushy. Since everything is cooked it's okay for you to taste to ensure the seasoning is to your liking and there is enough salt, pepper and broth. Once the seasoning is just right, lightly beat the eggs in a small bowl then pour over the dressing and mix well. Spoon the dressing into large casserole pan that's been sprayed with vegetable oil. Lightly spread the mixture out. You don't want to pack it down. Sprinkle regular paprika over the top and cover with foil. Bake in a preheated 350 F oven for 1 hour removing the foil for the last 15 minutes. This can be made the day before. To warm be sure to cover with foil. Different breads require different amounts of broth -- don't be afraid to use more or less. I started with a low amount and increased by increments.